OK, our garden may be pitiful right now, but someone is growing goodies! All of the strawberry farms opened early here in Virginia and we spent a chilly, windy morning picking 4 big buckets and one CJ sized bucket of beautiful strawberries. Yes, I know this is just two, I think the others were being washed...or eaten! Then we came home, ate a bunch, and then got busy canning. Well, the oldest canned, I cleaned and cut strawberries - and took pictures. Wish you could pop in and join us for breakfast! Coming Wednesday- results from our Once a Month Shopping! Tortilla Pudding Puffs and a Smile! Good morning friends! Not such a lovely day weather wise here in Virginia, but we have smiles on our faces anyway! ONE MORE WEEK and our oldest graduates from high school. Wow, how time has flown. We also want to take a second to welcome all of our recent visitors whom have also put a smile on our faces...Africa, Russia, Singapore! 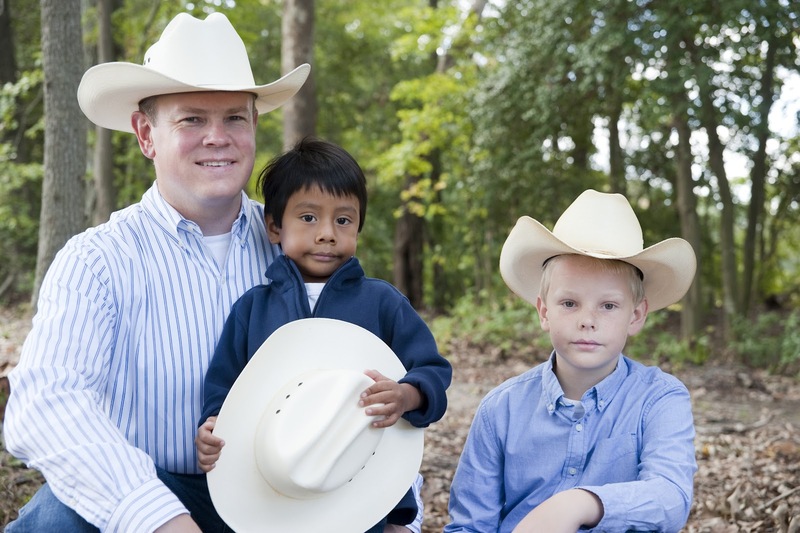 This family has learned some great geography lessons lately thanks to you. We are blessed that you are checking in and hope you will come back often. 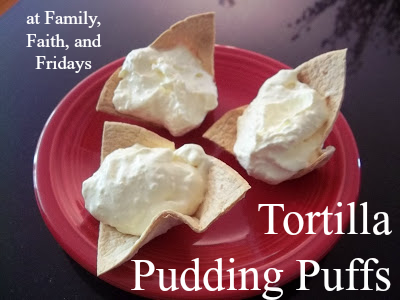 As for the pudding puffs, this recipe was given to me by one of my oldest friends; she's not old, she has just put up with me for the longest. Anyway, you know what I mean. We made this a lot when we fed large crowds of cadets at the Air Force Academy...easy, fast and a crowd pleaser. We have used chocolate pudding before, but it was not our favorite. Large floured tortillas, sprinkled with cinnamon and sugar and cut into fourths. Press into muffin tins and bake at 350 for 8-10 minutes. Refrigerate and then fill tortilla shells. No eggs, so a safe batter to lick! What are your plans for Fun Friday? It is our great desire to grow much of our own food; our being mine and my oldest, mind you! We dabbled in it a little last year and are trying to expand a little more this year. Keep in mind, we live in a rented house right now and do not have tons of land. As a matter of fact, out our back door you can see a golf course. Not exactly my dream land, but we are trying to make do with what the Lord has provided for this season. Not exactly encouraging! If you have an idea of what's wrong, please, feel free to clue us in! We did just get 24 hours straight of rain so I was in hopes they would have perked up this morning, but as you can see....NOPE! These are some of our squash plants. We cheated and did not start these from seeds this year. We planted half in the garden and half in containers, as you can see. There are zuchinni plants in another container as well. Reason being... SQUASH BUGS! They took over in the garden last year and ruined about all of our plants. (The oldest does NOT want to put any chemicals in the garden! Me, I wanted to stand out there with insecticide and just wait to spray one of those little bugs!) We want to test the theory that maybe some plants will be a little more protected in the containers. If you are shaking your head and know this is not going to work, don't tell us! ;) We want to pretend it is a good idea for a few more weeks. Here are our onions and potatoes, both planted by my father-in-law a few weeks ago. (His garden by the way, is amazing, and puts ours to shame.) Both are coming up beautifully, go figure. This family does not even like onions for the most part, other than I do cook with them, and we may end up with tons. The potatoes will be great! This is one of 3 pepper plants. Again, we do not just eat peppers, but I do like to cook with them so the plan is just to chop up and freeze what we are able to get. The herbs. Again, another cheater plant. We have tried seeds numerous times with no luck, so I finally got mad gave in and bought a few plants. Cucumbers are in, but have not come up yet. I still have hope! Here are some of our flowers, maybe we should just stick to those! In my dreams my garden looks amazing. It does have a fence now, thank you to the deer! Someday, when this Air Force moving family settles down in one place, I pray we will have abundant land and a place for my dream garden. Hey, maybe by then we will know what we are doing! Until, we welcome any advice and appreciate you muffling your laughter! How about you? What are you growing, and as long as you are writing, share your best gardening advice! Please! This post is linked up to Our Simple Farm...Simple Living Wednesdays. Pop in and give her a visit, you will love what you see! We are also linking up with The Homeschool Village! YOu may get to see some better gardens there! OK, so we just have to ask...what's up with incredible amount of blog traffic to ALP's Modesty post today? Loving it, but sort of confused as to why on a random Tuesday, weeks after her original post, the site is lighting up. We are thrilled and humbled to have you visit! "Oh no, another math book." That's how my fourth grader greeted this newest book for our review- Critical Thinking- Mathematical Reasoning by The Critical Thinking Company. Luckily, within a matter of a day, the bright colors, short lessons and wide variety of fun activities won him over. Now he is asking to do more pages! Mathematical Reasoning, Level F is geared towards 5th graders. The fun thing about Mathematical Reasoning is that every page is a little different. No rote facts or boredom here! Mix that in with a few game-like activities and lots of colors and pictures, and they had my kiddo hooked. Most activities are pretty self-explanatory, but when a new or harder concept is introduced there is a brief how-to at the top of the page. If you are used to a curriculum telling you exactly how to teach a new concept, you will have to transition to a slightly different style. The series is written with a spiral approach, meaning each new page builds on the previous, the same being true of each level. Obviously, your child may have a slight advantage having done earlier levels, but I think with a solid math background, he or she will easily catch on. Our favorite part, according to my son-the balance benders pages (just think puzzle like brain teasers that require problem solving skills). He did one, then immediately went through the entire book finding all of the other balance bender pages. He has since begged me to purchase the book that The Critical Thinking Company has for just that type of problem. While I would not use this as our stand alone math curriculum for 5th grade, I do think it is a wonderful resource to use, possibly even for a summer review for a struggling child or just when your child needs a break in the action from their current math program. We have been doing a few pages every other day as a reward for completing our other math; hey, it works for us! The Critical Thinking Skills Company is known for its engaging products, and this newest in its lineup will not disappoint you! From the publisher- "Mathematical Reasoning™ helps students devise strategies to solve a wide variety of math problems. This book emphasizes problem-solving and computation to build the math reasoning skills necessary for success in higher-level math and math assessments. This book is written to the standards of the National Council of Teachers of Mathematics. " You can buy Critical Thinking- Mathematical Reasoning here for $42.00, as well as view additional products they offer. See what fellow CREW mates had to say about this product here. Disclaimer- I received a copy of Critical Thinking- Mathematical Reasoning in exchange for my honest review. The views expressed our mine, and were not influenced by the company in any way. UNO- We love this silly card game and it is possible to teach younger kiddos to play. As a matter of fact, the youngest often wins in our house! Blockus- While you are limited to four players at a time, this is good game for all ages. CJ often has to be reminded to "just touch the edges", but he still enjoys it. Sequence- A good game involving number sequences so it can be used to teach numbers and matching skills, but competitive enough for olders. Doodle Dice- I may like this one more than the kids, I admit, but it is cute! Roll a bunch of dice with funny shapes on them to match a picture on a card. Easy for younger kiddos to follow, hard to win! The Settlers of Catan- OK, here's the deal. This game is pricey therefore I put off buying it forever. But the olders LOVE IT! We did buy the extension pack so we could all play, and this is one we save for after the four year old goes to bed. Be prepared for a long game, but it is worth it. Strategy is the key, and no, I do not win often. The key here..just have fun together. It seems in this rat race world, we forget to make time for our family. Families MUST be our PRIORITY! Make time for yours tonight! What games are you playing at your house? I have finally found it! A bible curriculum that I feel is worthy to use with younger kids that is not all fluff. 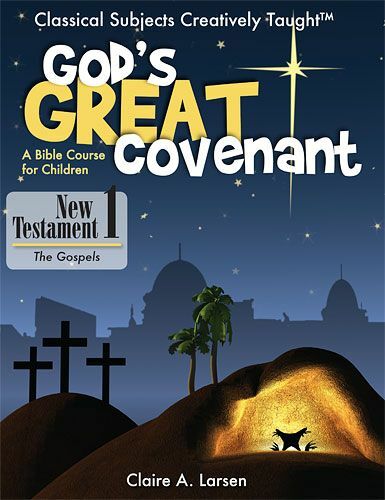 "In God's Great Covenant, New Testament 1: A Bible Course for Children, students will follow the story of Jesus, the Messiah and King, as He is born and fulfills all God's Promises. But Jesus did not arrive as people expected. The people were looking for a mighty warrior to deliver them from the oppressive Roman government. Instead, He came as the suffering Savior, who would die as the sacrifice for sin and death. He was building a kingdom that was not of this world - it was the kingdom of God!" The book begins with quite a few pages of detailed introductions about the cultural, historical and geographical background of the time period. We read through one introduction a day the first week as a starting point. This is not a section you want to skip! The information is very informative and helps fill in the blanks between the Old Testament and New Testament. After that, the book is broken into 36 chapters with review questions at the end of each. Every chapter has a memory verse, key fact chart and fulfillment of prophecy section. The text is engaging and fairly easy to read and my 4th grader and I took turns reading paragraphs to each other. 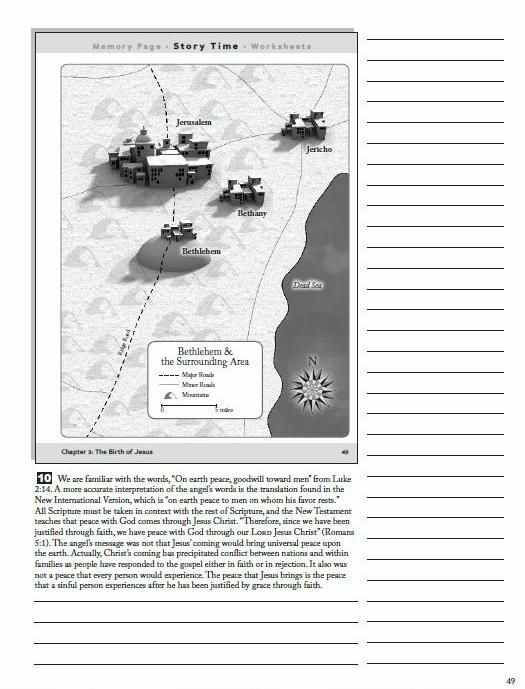 The separate teacher's guide is the full student text with the answer key and lots of additional notes. I mean A LOT! You will not have to worry as a parent about not knowing background information; CAP has you covered. I found I had to peruse the sections ahead of time to see what I wanted to add; otherwise I tended to interrupt the boy constantly to add additional information. There is also plenty of blank lined space to add your own notes. In addition to the student text which sells for $26.95 and the teacher's addition that sells for $29.99, you can purchase GGC Audio files, over three hours of listening, for $9.95. We loved this addition as it gave my auditory learner extra time to digest the information. The only drawback I see in this program is that CAP does not provide lesson plans for this particular book. That being said, it is easily divided into chapters, and would NOT stop me from using this program. It is one that we will add to our curriculum and continue to use. Check out CAP here for additional products they offer. Our family has also used their Spanish program and been equally as pleased with it! See what other CREW members had to say about God's Great Covenant here. Disclaimer- I received the Student and teacher's books of GGC as well as the audio file in exchange for my honest review of this product. This review represents our family's experiences and was in no way influenced by products received. Today is the day! I am going to choose a positive thought to replace every negative one that enters my mind. (After this challenging past month, let me tell ya, this could be a long day!). Won't you join me? Oh, wow, once I got on a roll this was E-A-S-Y! Maybe it won't such a long day after all. The key word is choose. Each day we have a choice, to wake up with a song in our heart and a smile on our face or we can wake up and ignore the wonders all around us. We can choose to change our hearts so that our words will follow. Regardless, it is a choice we make. It is also a habit to form. Maybe this should be a daily challenge! Matthew 15:18- But the things that come out of the mouth come from the heart..."
We had the pleasure of reviewing another science curriculum, this time geared for grades 3rd-6th. Christian Kids Explore Biology by Stephanie Redmond hit our mailbox a few weeks ago and I have to say, we have devoured it. Now, we do like science in this house, but this book is easy to like even if science is not your thing. It is well laid out with large units covering Biology Basics, The Plants in God's World, Birds of the Earth, Mammals in the Wild, The Human Factor, Reptiles All Around, Insects High and Low, and Water Creatures. The units begin with a vocabulary list and materials needed for any activities suggested, a plus for this busy momma! Each unit is then broken down into smaller sections that include the lesson, review questions and a section called Hands On Time. This section directs you to do further research on the topics or often a fun experiment. The lessons seemed a little short to me at first glance and I worried that there was not enough "meat" there, but with the additional activities listed I found that my son stayed engaged and learned a lot. A bonus was that he ended up doing his own search through books we had or the Internet, guided of course, to find out more information on the things he was really interested in. We used the appendices a lot- they contain book lists, coloring pages, reproducible notebook pages and experiment forms. If you need any more to do, additional activities can also be found there. Using the resources available, you could easily have a beautiful notebook at the end, if your child enjoys doing that. 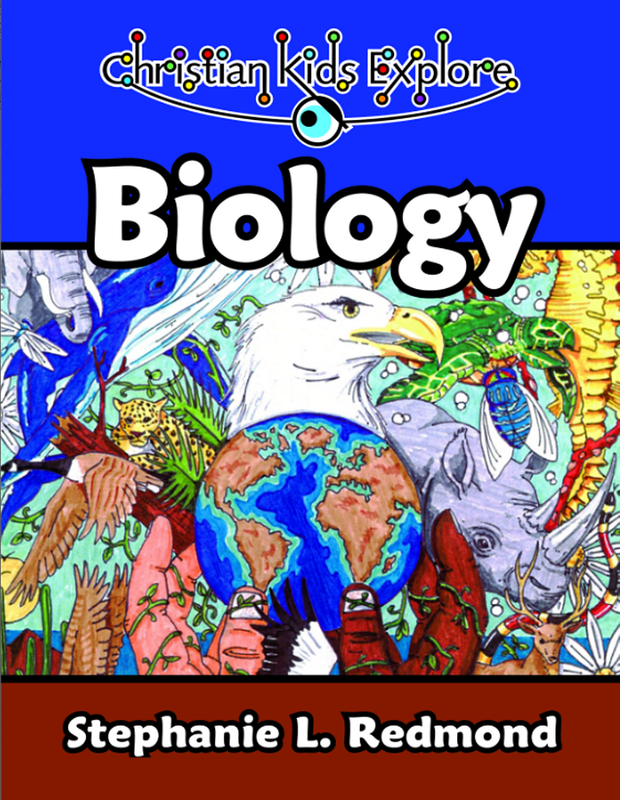 If you prefer, there is a Christian Kids Explore Biology Student Activity Book (Download) currently on sale for $7.95 to make multiple prints easier. The book itself costs $34.95 and can be purchased here. While you are there, check out additional titles in this series. Here's what my son had to say, "It was really fun, especially since I love animals. My favorite section was definitely the reptile one. After reading that section I did a lot of research on snakes!" If you are looking for a good first year Biology course from a Christian view point, I would recommend Christian Kids Explore Biology...no evolution here! This one is a keeper! You can see what my fellow CREW members had to say about this product here. Disclaimer- I received a copy of Christian Kids Explore Biology and the Activity Book Download in exchange for my honest review of this product. The views expressed are my own, and were not influenced by the company. Check out this great giveaway at Raising Olives. They are giving away one Child Training Bible from the Dunn Family! Pop on over for your chance to win! 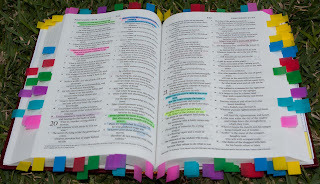 "The Child Training Bible uses a system of cards, tabs and highlighters with a standard-sized Bible to create a Bible that is easily marked and tabbed to allow you to quickly and easily locate the passages of Scripture that apply to many of the areas of sin that children and adults struggle with. The Child Training Bible covers more than 20 topics including: disobedience, fear, fighting, defiance, lying and impatience. Each topic has eight or more Scripture references, some heart seeking questions (“Are you showing patience in this situation?”), some application questions and a simple prayer for help with this problem." The Child Training Bible is simple to assemble, although it does take a bit of time to complete. If you win, your kit will include an English Standard Version of the Bible, tabs, highlighters, clip and set of Child Training Bible charts. Everything that you need to complete your Child Training Bible will be included. So ya know how we all have our favorite blogs we follow? I was not going to be one of those people. I was sure I did not have time, and secretly I was afraid to get drawn into reading hundreds or so. So I entered the blogging world s-l-o-w-l-y! BUT, I have found several particular sites that I admit I love. For example, Blissfully Content. It's a beautiful site, and Julia is so sweet. You can just tell! I think we could become great friends if we lived closer...she inspires me. As a bonus, the music on her site is heaven sent. I told her I was going to start going to her site to have my quiet time. Anyway, I digress. A few weeks ago she did a fun series on the Depression Era and recipes from that time. (scroll down her sidebar, you will see the recipes listed under Depression Recipes) They sounded yummy and her pictures drew me in. I decided to try one. Here's how it went... I told the kids we were having mashed potatoes and hamburger gravy for dinner. One child rejoiced...her idea of a perfect meal! The rejoicing child! And helper for the evening. As an update, hubby's surgery went well, arm is feeling good and cast came off yesterday, a week early. Huge praise! A peek at the patient...one of the first days after surgery and still on pain meds, mind you! Those flowers are lovely, aren't they? This is one of Riley's photography assignments from a few weeks ago. I'm biased, I know, but I do think it is a beautiful picture of beautiful flowers. So delicate, so dainty. Like so many other blooming trees, shrubs and flowers around our house right now. "How can something so pretty be so bad for so many?" The reality is that there are many things like that out there in this big world. Wrap anything up with a nice "ribbon" or a fancy "bow" and it can look attractive. We just have to open it up. Advertise something with a fun twist and a pretty face and we all know it needs to be ours. Tell people how great something is and we all want it too. Wolves wrapped in sheep's clothing. Proverbs 14:5 "A truthful witness does not deceive, but a false witness pours out lies." Oh, friends, we are surrounded by false witnesses. It is easy to be misled. It is easy to be persuaded. It is easy to be convinced something or someone is lovely because it is wrapped in a lovely package. But looks can be deceiving...just like those beautiful, purple flowers. On the surface things may seem so innocent, so truthful, so harmless, but beware! Not all that is lovely is good! And so I encourage you to look beyond the surface. Do your research. Examine your hearts and measure everything against God's word. The world will deceive you. The Lord never will! TOS Review- AIMS:What on Earth? Good science programs are hard to find. Good science programs for younger ages-even harder. So I was excited to review What On Earth? by AIMS Education Foundation for Kindergartner-1st graders. AIMS stands for Activities Integrating Math and Science and has many books in this series ranging in subjects and ages. AIMS is a non-profit foundation dedicated to helping teachers give students a solid conceptual understanding of math and science. In 1981, 80 elementary and middle school teachers who shared the dream of giving students a strong hands-on foundation in math and science came together at Fresno Pacific and wrote the first AIMS’ activity books. Teachers loved them! Students learned more, learned in greater depth, and enjoyed learning. The word spread, and soon teachers across the nation were using AIMS to engage their students in hands-on learning. For this review we concentrated on the Rocks and Soil chapter with our kindergartner! *The book covers a broad range of subjects. The chapters include Resources (Including recycling lessons), Rocks and Soil, Water, Change (Hurricanes, Earthquakes, Volcanoes), Day/Night and Seasons. *Great graphics! There are cute stories to cut out and make books with, songs to sing, and projects to make. *A CD is included. On it are pages you can print for the activities as well as additional pictures on the various topics. *Well organized. Each lesson contains key questions, learning goals, material lists, background information and then teaching procedures, as well as follow up questions at the end...a must for days I am brain fried and just cannot form an intelligent question on my own! *We did find some of the activities presented at a little higher level than our kindergartner was ready for. We had to leave out several of the writing activities and do those verbally. *Supply lists- I am a busy mom, so I tend to shy away from any activity that demands me to gather supplies. Luckily, most were things you can find around your house, but again, takes time! *Classroom base- I got the feeling that much of the book was classroom based. While the activities can be adjusted for one child of course, we homeschool moms tend to like things written just for us. While I feel like our family could not use this as a stand-alone curriculum, it is a good, solid resource for those looking for additional projects for their science program. It is fun, engaging and well written. You may purchase the book here for $21.95. Included with the book is a CD with printable student pages. Check out what fellow CREW members had to say here. Disclaimer- I received a copy of AIMS What On Earth, in exchange for my honest review. My views reflect our family's experience and may not be the same as others who use this product. Labels: science, TOS Review, What in Earth? We never intended to homeschool through high school! Really! Our plan was to school the kids while they were little and we were "able" and at the same time save enough money to send them to a private Christian school when the work really "counted". God had other plans! Each year we loved homeschooling a little more, and each year He changed our hearts a lot more. And so here we are, getting ready to graduate our first child from high school and start our second child in her freshman year. While I do not profess that homeschooling is for everyone, I do know that it is what the Lord has intended for our family. And for that, I am humbled and grateful! Each day is a new adventure and each day I delight in seeing the kids grow intellectually, emotionally and spiritually! Note, because our children take a few high school level classes in 8th grade, it allows them to essentially finish early and have a year free to begin college while still at home. Our oldest did so and will be done with her freshman year when she heads off this year. Because it was so successful, we will start the next kiddos a year younger (lucky them), with just a class each semester of their junior year. Saves money, saves time! So there ya have it! My plan! Not to be confused with God's! Our first week of our monthly shopping has gone very well, ie. I did not forget too many things we needed when we shopped. But...we are taking at least two days off our schedule starting today. My beloved is having arm surgery this morning, and because my health has not been up to par lately, the Calvary has been called in! Yipeeeeeeee! My in laws are coming to help and we are so thankful! Since we are not sure how long we will be gone even though he is scheduled for an "out-patient" procedure, we will feel better that they kiddos are not alone. My mother in law is a great southern cook! She's just a great cook. So the kids are so excited to be fed by Grandmama for a few days...to be pampered and spoiled, to make homemade treats and play games. ALP is excited to have help from her grandfather in the garden (we will post pictures next week) since dad is going to be out of commission with his arm for 4-6 weeks we are told. That's where she gets her green thumb, Grandfather, not dad....here's a picture of the area they will be working on. 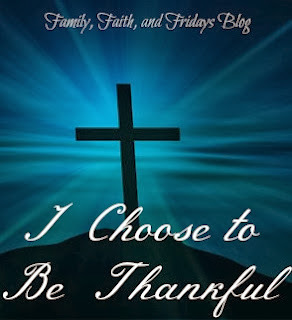 So no recipes today, I am off to the hospital with CP, but I would ask that you join us in prayer for a successful surgery and speedy recovery. The Strong Willed Child. Do you have one? I do! God, in His infinite humor, waited until our last to give bless us with him. Let me start by saying, in case you do not know us, we adore this child! We love this child dearly! He was longed for for years, he was prayed for for years, and we fought hard to bring him home. He makes us laugh, he is smarter than us (really, I think he is), and he is a love bug that loves to snuggle. The Strong Willed Child....they are just wired differently. They push the rules- constantly. They change their minds- regularly. And they dig their feet in the sand- stubbornly. Me- You can wear shorts today! Child- Oh. I don't like shorts. They are disgusting. (His new favorite word) I am never wearing shorts! Child- I don't like books. No books, ever! Me- OK, bedtime them. We can read tomorrow. Child- But I want you to read me books! See? And then I question..are these possibly adoption issues? Are these SWC issues? Some days I struggle to figure it out. And some days, I just want a do over! In my questioning and talking to other parents, I was given a wonderful book called Raising Your Spirited Child, by Mary Kurcinka. Did you catch that...SPIRITED child, not STRONG WILLED child. Spirited...that's what caught my attention. I love that! SWC implies negativity, spirited implies, well...fun and challenging. It's all a matter of how you look at it and how you approach the child. It's about giving that child a little more time and a little more freedom to choose their path within the guidelines you provide. It's about wording things just slightly different. It's about a lot of patience and a lot of love. It's a challenge, but it is making a difference. A little at a time. I'll take it! We tend to be cyclic here- one bad week for every two good ones. So we are rejoicing in the good and pushing through the bad one with better attitudes and smiles...us, if not him! :) And we know that God has a wonderful plan for this spirited child...just as He has a plan for us! Jeremiah 29:11" For I know the plans I have for you," declares the Lord, "plans to prosper you and not to harm you, plans to give you hope and a future." Ephesians 6 "Fathers, do not exasperate your children, instead, bring them up in the training and instruction of the Lord." 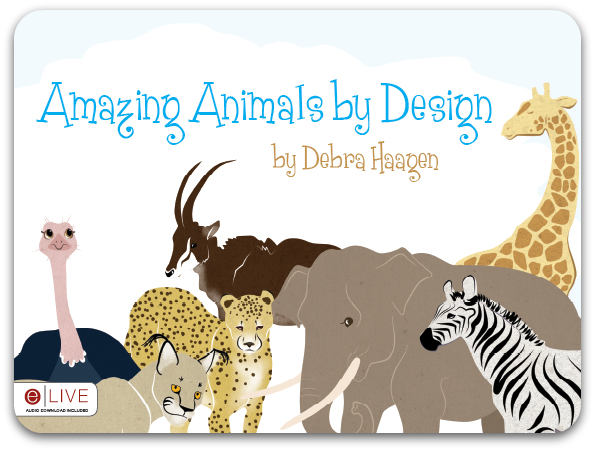 I admit, I have been counting down the weeks until my first review, and I am so excited that Amazing Animals by Design written by Debra Haagen got to be the one! I love this book...but then, I suspected I would before I ever read it. It's a wonderful story about animals that points kids to God. In my experience, finding a science based book written from a Godly point of view is difficult at best. Look no further! "There are books explaining the theory (Intelligent Design) for older students and teens, and there are storybooks about Creation. What I was finding with children I worked with in church and other places, however, was that when many children get to elementary school age and start to learn about the theory of Evolution, they believe the storybooks to be just that - stories. I wanted storybooks for use in church and in homeschool with my own children that would begin to explain to younger children that there is scientific reason behind the theories of Creation and Intelligent Design, in addition to the historical documentation we have in the Bible. When I could not find any books like that, I decided to start writing them. Amazing Animals by Design is my first, and I hope there will be more in the series. I wrote the book for children ages Pre-K up to about 3rd grade, at which point they may be able to understand the more scientific books that have already been written." The story begins with siblings John and Sarah going to the zoo with their parents. Each page introduces a new animal and tells how God created it specifically for a purpose, with the kids getting to ask the zookeeper all kinds of questions. Debra does a great job of using words like camouflage, predators and prey to strengthen a child's vocabulary while incorporating the definition in the text. Since we received this book digitally pre-release, I printed out a copy to read to the younger boys. We have about worn the paper out and have since ordered two copies, one which we will giveaway to a lucky reader as soon as it arrives. CJ loves the animals pictures and has not tired from reading it nightly. 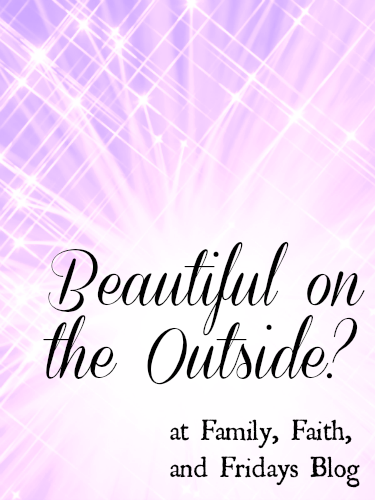 This is definitely not a book limited to homeschooling families, but one to be enjoyed by all. Amazing Animals by Design has found a place in our family library as a favorite! Do you know what a caracal is? The website for Amazing Animals by Design is up and running at ttp://debrahaagen.tateauthor.com/ . You can read what my fellow CREW members had to say about this product here. Disclaimer: I received a complementary download of this product in exchange for an honest review. I was not compensated in any other way. The opinions stated are my own and may not reflect the views of others. OK, A few weeks ago I discussed saving money, specifically on your grocery bill. I admit, I often waffle back and forth on the ideas...trying something new every once in a while. So this month, here's the plan...Once a Month Shopping. One of the points from my earlier post was the less you are in the store, the less you will spend. I am going to test that theory this month. Now here's the deal...everything I read about once a month shopping does say that you will have to go to the store at least once in the middle of the month for a few perishables....but for the most part your goal is to stock up for what you will need for the month. Be sure to make sure that includes staple items, such as flour, baking soda, whatever. Our goal will to be to stay OUT of the grocery store as much as possible. I think that sounds heavenly! So, here is my meal plan for the month. Keep in mind, I try to stick to simple meals....one because they cost less and two, because I have picky eaters. (Been there, done that too many times with whipping up some culinary delight to only hear "WHAT is this?") Leftovers are not in the plan because that is usually what the kids and I eat for lunch. A breakfast meal is included once a week, as is a "fun food" for our Friday Family Nights. I have not listed any side dishes...we usually add a salad several times a week, brown rice or potato of some sort, and fruits and veggies that are on sale for that season. Again, we are trying to eat well while still cutting expenses! I will keep a running total and at the end of the month I will let you know how we did! I will also post on how we made a master shopping list and figured out how much of each thing we thought we would need for a month. Anyone else up to trying out the once a month shopping challenge?